I offer a range of services to cultural organisations, institutions and more, through my own small company Studio Zeytin. I am working with MitOst in Berlin in developing a content strategy and curating an online newsroom for the Tandem Cultural Exchange Programme. I have been working as a digital coordinator for the European Cultural Challenge 2018. I have worked closely with the European Cultural Foundation between September 2011 and June 2017. I first started as an editor for their Narratives for Europe initiative, for which I created a brand new website. I then started advising ECF on digital matters and designed their corporate website in 2014, which I have been responsible for editorially for three years. I have also developed an online strategy for the whole team and have managed ECF's social media and the monthly eZine. I have designed Morgenland Festival Amsterdam's website, a music festival that aims to create spaces of creativity going beyond stereotypes and West vs East dichotomies. I have I have designed and am managing the City in Translation website, which is a project I have started during a writer's residency in Copenhagen. I have designed and am managing Meydan | La Place, a French-speaking website presenting contemporary cultures from Turkey and accompanying the anthology of Turkish contemporary literature I edit and translate for Publie Net. I was editor and writer for the Discover Turkish Wines online magazine produced by House of Red and White based in Austin, TX. 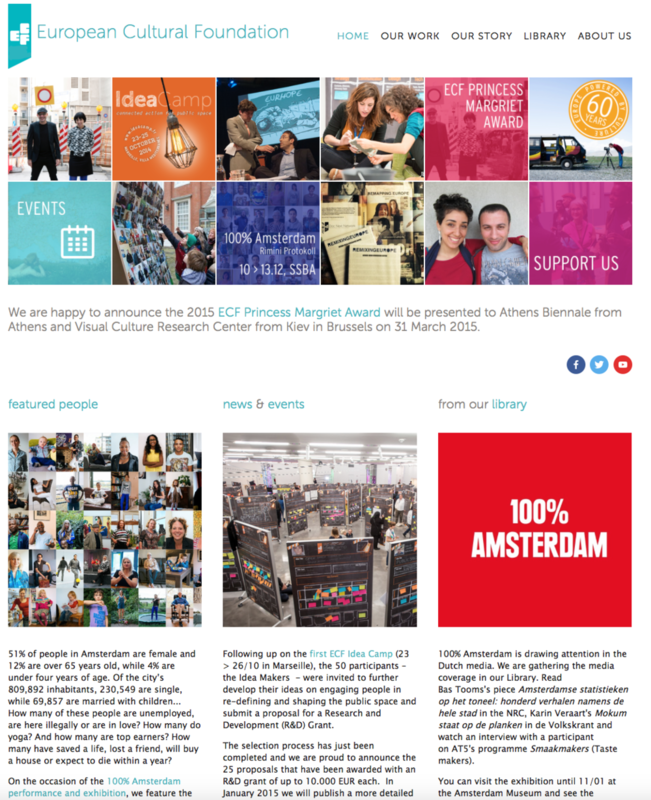 I managed social media for the Prince Claus Fund during their Culture in Action: Prince Claus Award Week 2013. When I worked for the British Council Benelux between 2008 and 2011, I managed online communications for the Amsterdam office and have launched project related digital initiatives such as the Language Rich Blog, advocating multilingualism across Europe, and the Indie Goes Mobile competition for young people, using their mobile devices to create films about inclusion and diversity in school.